Years ago, before I was 10, my grandfather owned a farm in the Northern Transvaal (now called Limpopo). This tractor reminded me of our visits to my grandparents over the Christmas period. I remember two small tractors, similar to this one, that stood on their property, with flat tyres and worn-out engines. The strange thing is that I can also remember the (very distinctive) smell of old oil and grease (from the tractors) baking in the sun, and now as I look at this photo I swear that I can actually smell it again! Posted in General and tagged farm, vehicles on Monday, 16 November, 2009 by Paul. Thanks Zeandre. I think the long grass growing up around it adds nicely to the rusty and discarded look. Yes Paul, that does bring back memories. I wonder what it looks like there now. 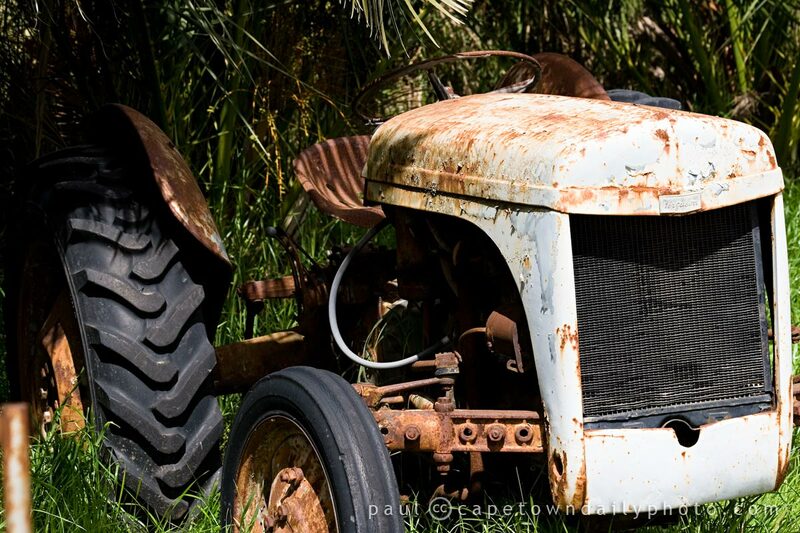 Oh I like this photo Paul, love the rusty look and yes I’m sure it’ll bring memories for you! I’m sure she would James!